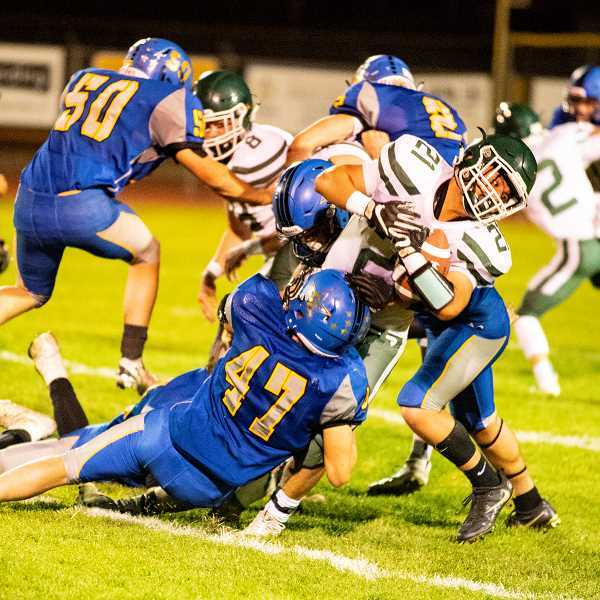 The host Crook County Cowboys rebounded from a disappointing shutout loss to The Dalles a week ago to roll to a 37-12 win over the North Marion Huskies Friday night in Special District 2 football action. North Marion, which started the year 3-0 before a 21-0 loss to Woodburn last week struggled with turnovers throughout the game, and Crook County was able to take advantage of the mistakes. "A huge improvement across the board," Crook County head coach Ryan Cochran said of his team's performance. "Both offense and defense, but mostly mentally, Our kids went out and executed their job, but I was super proud of them for fixing those mental mistakes that we have had the last few weeks." Although they came out on the short end of the score, North Marion head coach Keith Bennett was also pleased with his team's effort, despite having several players who missed the game with illness. "I was pleased with the kids that they didn't give up they kept fighting the whole game," he said. "You know that's a lot of teams can use that as an excuse, we aren't going to our team rallied all week for the sick kids and so we came out and we played as a team and we gave it our best effort. The kids they played very very hard through a lot of adversity, I couldn't be more proud of them." The Cowboys received the opening kickoff and quickly marched down the field taking just four plays to drive 65 yards for a touchdown. Crook County quarterback Brody Connell carried the ball across the goal line on a nine-yard keeper to put the Cowboys on top for good. North Marion picked up a pair of false start penalties on their opening possession leaving them with a first and 20. A fumble, which was covered by North Marion lineman Beau Wilson left the Huskies with a second and 26 on the Crook County 14. Then on the ensuing play things went from bad to worse for the Huskies as they fumbled again and this time Crook County's Clayton Berman fell on the ball, giving the Cowboys a first down on the North Marion 11. One play later fullback Jason Slawter punched the ball into the end zone. Erick Gonzalez carried the ball across the goal line for a two-point conversion and the Cowboys led 14-0 just two minutes into the game. On their next possession North Marion moved the ball from their own 25 to near midfield, but the drive stalled and the Cowboys took over on downs on their own 48. Three plays later Kyle Knudtson sprinted around the right end for a 23-yard touchdown. Connell threw the ball to Dominic Langley for a two-point conversion and the Cowboys led 22-0 with nearly five minutes remaining in the first quarter. North Marion attempted to battle back, moving the ball from the 40 all the way down to the Crook County 26, but the drive stalled and on fourth down Crook County's Hunter Bishop intercepted a pass from Noah Wierstra for the third Husky turnover of the game. However, four plays later Crook County running back Jacob Kleffner fumbled the ball and North Marion's Ethan Hayes fell on the ball giving the Huskies the ball on the Crook County 35-yard line. Six plays later Samuel Garcia carried the ball straight up the middle for a two-yard touchdown. The two-point conversion attempt failed, but the Huskies were back in the game, trailing just 22-6. It didn't take long for the Cowboys to answer. Just four plays later Connell found Langley in the back corner of the end zone for a 30-yard touchdown pass. Gonzalez converted the two-point conversion and the Cowboys led 30-6 late in the first half. North Marion's next drive started promisingly enough, but Slawter sacked Wierstra causing another North Marion Fumble, and for the third time in the game Berman fell on the ball, giving Crook County possession on their own 40-yard line. "Our blocking scheme broke down in the first half at The Dalles after we got three touchdowns called back on us," Berman said. "So, we worked on penalties this past week. We actually ran this conditioning for 14 minutes straight for every penalty it added a minute so we had 14 last week, so we really worked on it, Yeah, we paid for it real hard. It means a lot that we were able to clean up our mistakes and come back from that other game." Crook County drove all the way to the 20-yard line, before Johnny Page stepped in front of a Connell pass intercepting the ball on the two-yard line. And that's the way that the half ended. The second half was more of a defensive battle, with both teams struggling to move the ball. 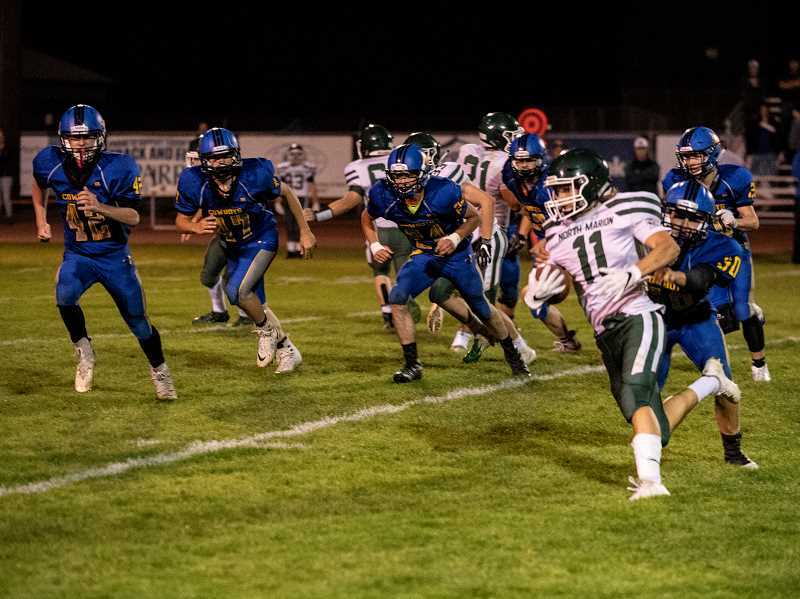 Crook County scored their final touchdown midway through the fourth quarter when Langley carried the ball on a reverse around the right end for an 82-yard touchdown run. Connell's kick made the score 37-6. The Cowboys had one more chance to score when Tyler Humeston recovered a North Marion fumble, the Huskies fifth turnover of the game. However, Garcia intercepted a Connell pass, giving the Huskies the ball on the Crook County 7. With both teams going to their benches the Huskies went on their best drive of the night, going 93 yards in 12 plays, finally scoring on an 8-yard run by Hunter Wierstra. "It's pretty hard," Garcia said of the loss. "Especially since we have a lot of sick kids, but we faced adversity and the second half came out and played our game. I was very proud of my team at the end. We showed a lot of heart out there." Crook County then ran the clock out, ending the contest. The Cowboys finished the game with 356 yards of total offense, while the Huskies had 247 yards. However, 93 of those yards came on the final drive. With the win the Cowboys improved to 3-2 on the hear and 1-1 in league, while the Huskies fell to 3-2 overall and 0-2 in league. 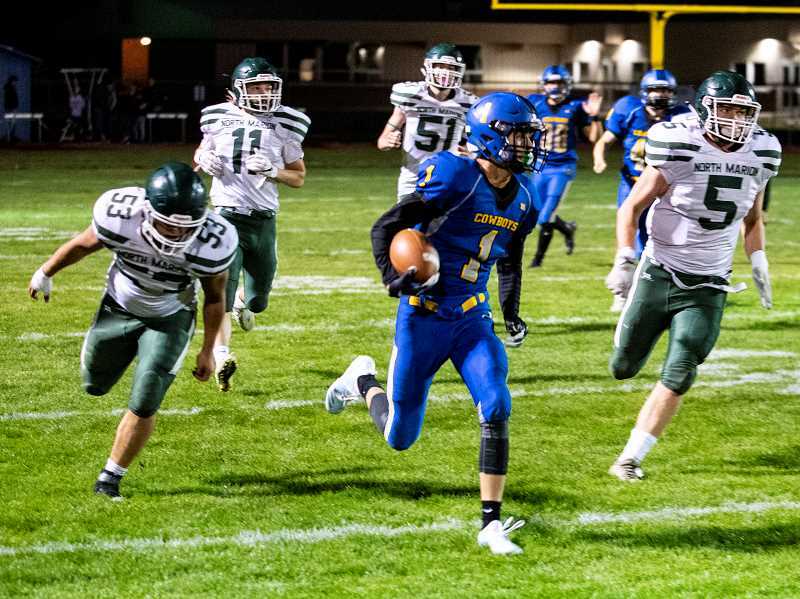 Crook County will host Gladstone next Friday, while North Marion hosts Estacada. Both games are scheduled to start at 7 p.m.
CC - Brody Connell 9-yard run, two-point conversion attempt failed. NM - Samuel Garcia 2-yard run. Two-point conversion attempt failed. CC - Dominic Langley 30-yard pass from Connell. Gonzalez run. NM - Hunter Wierstra 8-yard run, two-point conversion attempt failed.